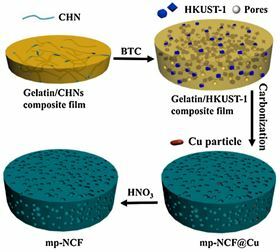 Pan Hu and Xinsheng Peng of Zhejiang University, in Hangzhou and Donghui Meng, Guohua Ren, Rongxin Yan of Beijing Institute of Spacecraft Environment Engineering, China, explain how they could convert gelatin/copper hydroxide nanostrands into a composite film of gelatin/HKUST-1, which they could then carbonize to generate the free-standing composite films. These films have a high specific energy of 28.1 Watt hours per kilogram and a specific capacity of 316 Farads per gram at a current density of 0.5 Amps per gram. They also have a capacitance retention of almost 93% and degrade by a mere 0.00064% after 11000 charge-discharge cycles, the team reports. Porous carbons, with their high surface area to volume ratio have been the focus of much research for their potential applications in electronics, separation science and beyond. They can be generated by chemical vapour decomposition, laser ablation, chemical or physical activation, carbonization of polymer aerogels, carbide-derived carbon, as well as template procedures. Often, their production then requires an additional step to dope them with nitrogen. Simpler approaches to functional porous carbons, for development as electrodes or supercapacitors are keenly sought and as such Hu and colleagues have sidestepped the problem of low doping levels seen with earlier approaches. Instead of using post-treatment with ammonia gas, the team has demonstrated how starting with a nitrogen-rich carbon compound and the carbonizing the processed material gives them much higher nitrogen content and so potentially more powerful electrical phenomena in the resulting doped material. They previously suggested gelatin as a low-cost, abundant fibrous material having a high nitrogen content, by virtue of it being a protein, as a precursor for a doped mesoporous carbon. Early studies required harsh conditions to generate the mesoporous material, but this leads to powders that then require a non-electrochemical binder to hold the particles together in a solid block before use. The presence of the binder inhibits activity, so a binder-free approach would be better. The team's room temperature method generates active thin films rather than powders and so requires no binder to aggregate particles into a usable component for their supercapacitor. The team concedes that their thin films are no more electrochemically active than other carbon-based materials, it is their method that sets apart the products and opens the door to a cool and efficient fabrication of supercapacitor films.